Lilliput is a digital peep show installation inspired by Edison’s Kinetoscope and other early motion picture devices. Lilliput is a little man who lives in a room built into a wooden box. When he wakes up in his bed he is surprised to find out he is under surveillance. The spectator can watch animated 3D characters through the peepholes on top of the box. The animation loop is 2.5 minutes long and it shows Lilliput’s room from above. Big staring eyes are peeping at the character from the window and doors and he gets annoyed when he can’t get rid of them. In the end the spectator becomes one of the peeping eyes that disturbs Lilliput’s life. The unlucky little man continues his life under surveillance endlessly. 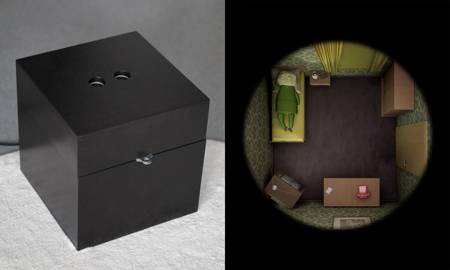 The form of the installation and the design of animation gives an impression of a magic box. Lilliput’s voice, footsteps and other sounds can be heard when one approaches the installation. A vibrating speaker also gives spectator also a haptic experience. The box has a lock indicating that there’s a secret inside. The installation goes back to the early roots of moving images by offering a small scale spectacle for one viewer at a time. The theme of the work is peeping and its different forms in our society, such as reality television and surveillance cameras. It doesn’t give any straight answers about the theme but rather gives the viewer freedom in his or her own interpretations.